If you have a border around an image that's embedded in a text block, you can change or remove it. This process only applies to an image placed inside a text content block. Use the Photo Editor to edit images in image content blocks. On the Design step, click the text block where your image is located. Double-click the image to open the Content Manager. Click show image style options to expand additional settings. Under Image border, type "0" in the first box to remove the border. Leave the drop-down menu set to "none" and the color field empty. If the border still appears on your image, make sure that the border is not embedded as part of the image itself. You can crop images and make other adjustments using the photo editor in the Content Manager. 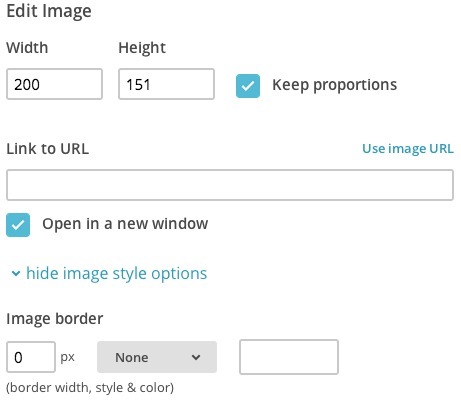 To work with most email clients, Mailchimp templates are no wider than 600px. Learn how to exceed this width limit when needed.